Shadows over Camelot: The Card Game invites you to play the role of sons & daughters of the legendary Knights of the Round Table who unite to defeat... the game itself, represented by a deck of Rumor cards that threaten to overwhelm Camelot. Listen carefully to these rumors and employ your keen sense of observation and the collective wisdom of the group to decide the right time to embark on Quests and collect 7 White Swords to achieve victory. Collaboration is essential. Like in the eponymous board game, and unlike other more traditional games, you will either all win - or all fail - together in this game. Alas, perhaps not... There may be a Traitor in your midst, a player who drew the “Traitor” Loyalty card at game start and will work to defeat you all by secretly helping to place 7 Black Swords on the table. Your goal is to make sure you get 7 White Swords first! First, I’ve never played Shadows over Camelot. I do really enjoy playing Battlestar Galactica so I’m familiar with the hidden role/traitor type gameplay. I bought this for my wife because she also enjoys BSG but we don’t own it and don’t have any friends to play it with. My hope was that the card game version would be easy enough to introduce others to playing it and the Arthurian theme would be more approachable than ‘scary sci-fi’. The mechanisms are very simple. You flip over the top card and add it to the stack. Players have to keep running totals of the numbers displayed in several categories (Pixies, Saxons, Dragons, Grails and Excaliburs). So, in that respect it’s just a memory game. But there’s also the potential (not guaranteed) for a traitor in your midsts. Ever try to remember something when somebody is actively trying to make you mentally trip up? It’s tough. Ok, so it’s card counting (more or less) with the house trying to screw you up by shuffling the deck too early for your count to be worthwhile. Wrong game, same idea. But then it gets harder. Some cards don’t have a number, they have a ? which has a value of 1*number of ? of that type. So, if you have 1 ?, it’s worth 1. If you have 2 ?, they’re each worth 2, so 4 added to the count. Mathematically, add the square of the ? count to the total. Yeah, that’s fun. Now the game screws with you. Morgana comes out and does two mean things. One, players can no longer communicate. Not just ‘no talking’ – no communicating in ANY FORM. And then she screws up the count in some way by adding values or removing values from the total OR she gives the traitor even better ways to screw with the other players. Whether it’s putting cards face down on the stack but announcing what the card was or simply making you count out loud each time you flip a card over it’s becomes insane to keep track of five different running totals. So why do you do this? When a card appears of a particular type that puts the total up to 11, 12 or 13 you want to go on a quest to earn White Swords. Beware though, if the total is 13 you earn one or many black swords. Basically, the game is super simple, but there’s so much fun in trying to keep the numbers straight guessing, second guessing and then triple guessing a decision to go on a quest can leave everyone laughing. Until the traitor stabs everyone in the back and they’re the only one laughing. Since I am mostly a solo game player, my review only concerns the solo experience of this game. The game puts you in the role of sons and daughters of the Knights of the Round Table who unite to defeat the threats that overwhelm Camelot. You have to listen to rumors and decide when it’s the right time to go on a quest in order to collet 7 white Swords to achieve victory. But wait…there may be a traitor in the group….too bad no traitor when you play solo. Really good quality components and cards. The illustrations on the cars are beautiful and colorful. It’s a Days of Wonder quality game. The rule book is well made, the rules are simple and clear to understand. There is an index table on the back for fast game reference. 1-	Listen to rumors: draw the top card of the rumor pile and place it face up on the Threats pile so only the last one is visible. There are 4 different color types of rumors (each one with unique potential rewards). 2-	Go on a quest: the top card of the Treats pile is the main quest. Take the Threats pile and sort them in piles by quest type (color). Mordred, Vivien and Merlin cards modifies the gameplay and Quest outcomes then compute the total Rumor value of each quest. 11-12-13: you successfully complete the quest: take the number of white swords according to the quest followed. The game itself is really simple to understand and play. It’s almost a memory game since you have to keep track of which rumor cards are in the pile and decide when its best to go on a quest. The difficulty is to remember what each Mordred cards means. But it’s not so bad because each card has a number on it that can be referred to in the rulebook for a detail explanation. For the game itself it has an infinite replay value since the rumors pile won’t be the same twice…It’s more a matter of will you want to replay the game. I never played Shadow over Camelot (the board game) since it requires 3 players to play it but it is a game that I want to play. When I saw this game in my gaming store I said to myself Wow Shadow over Camelot that can be played alone. The box stated that it is a fast-paced challenge that recapture the tensions and fun of the original board game…..I could I be wrong picking up this game…..The problem is that it is not a solo game. Even in the rulebook the solo variant states that it is for beginner to PRACTICE the game. I think that it is wrong and almost dishonest that Days of Wonder put 1-7 players on the box. What makes this game fun is the traitor aspect and that you cannot control other players action going on a quest…remove that and there is no more game. I will have to try this game with other people to decide if I remove this game from my shelf. First off-the-bat, this is not Shadows Over Camelot. They share the same name but the similarities really end there and that’s OK because Shadows Over Camelot: The Card Game is a good time on its own. The game is easy to teach and atmospheric in nature as you, sons and daughters of the Knights of the Round Table listen to rumours brewing in the land and have to make the decision when to go out on a quest. But you have to keep your guard up because there are likely a traitor or two in your midst and they will sabotage your efforts to keep the land safe. If you like a nice, fairly-light romp with a group of good friends who don’t always have to take their games so seriously then this one will definitely fit the bill. Every time I’ve played it’s always a down-to-the-wire affair and depending on how the group co-operates dictates your success or failure. There’s even elements in the game where you’re not allowed to communicate and have to try to keep track of everything going on without help and that just adds to the fun of the game. It’s short (about 20-30 minutes per play depending on your group), thematic (who doesn’t like knights of the Round Table?) and fun and if you’re looking for a good filler or something to play with friends who don’t appreciate brain-burners, Shadows Over Camelot: The Card Game is a great choice to bring to the table! Now I like Shadow’s Over Camelot, but this card game does the game a disservice. In this game you draw cards and remember numbers to get a certain total to successfully complete quests and earn Swords. Seven white swords and you win the game. If you get less than a certain number or have 14 or more points you gain black swords. Seven black swords and you lose. I found this game to be very uninteresting and dull. If you like counting cards then you may like this game, otherwise; skip it. 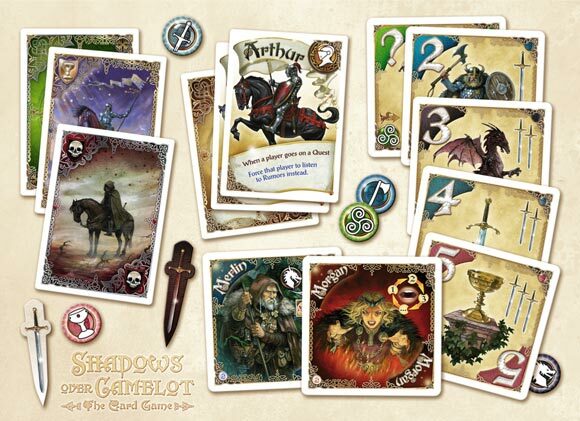 Add a Review for "Shadows over Camelot: The Card Game"